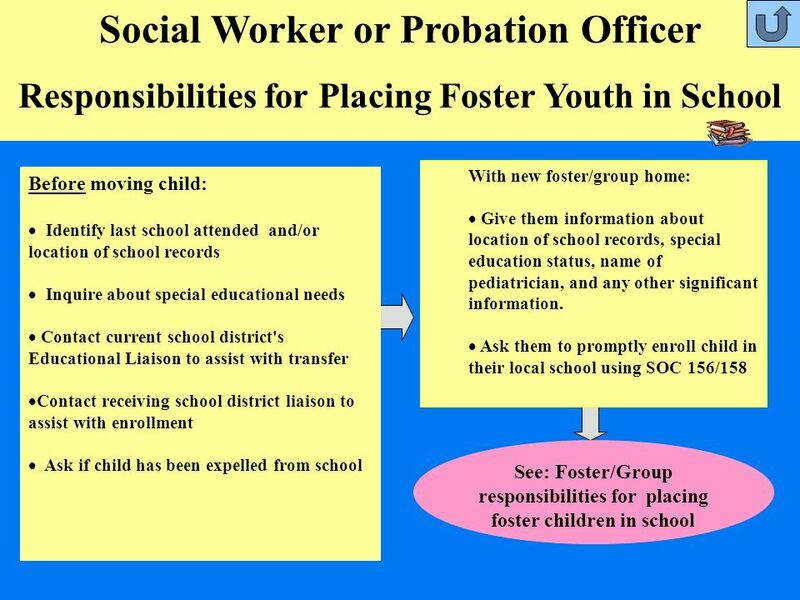 Social Worker or Probation Officer School District or Local Educational Area Group Home or Foster Home Timely and appropriate educational placement for foster care youth depends on the collaboration of these three stakeholders. 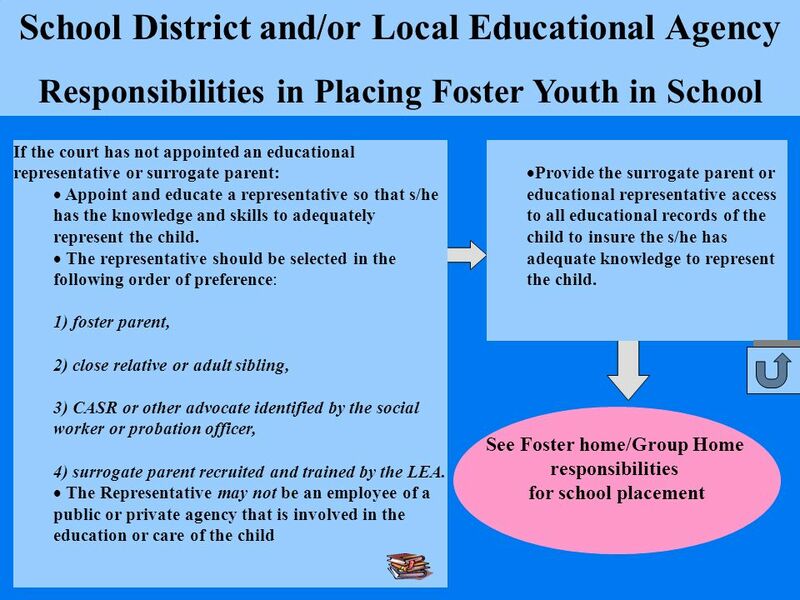 Responsibilities for Placing Foster Youth in School If child is identified as potentially eligible for Special Education: Notify the special education administrator or education liaison of the school district or county office of the child’s admission to the district. 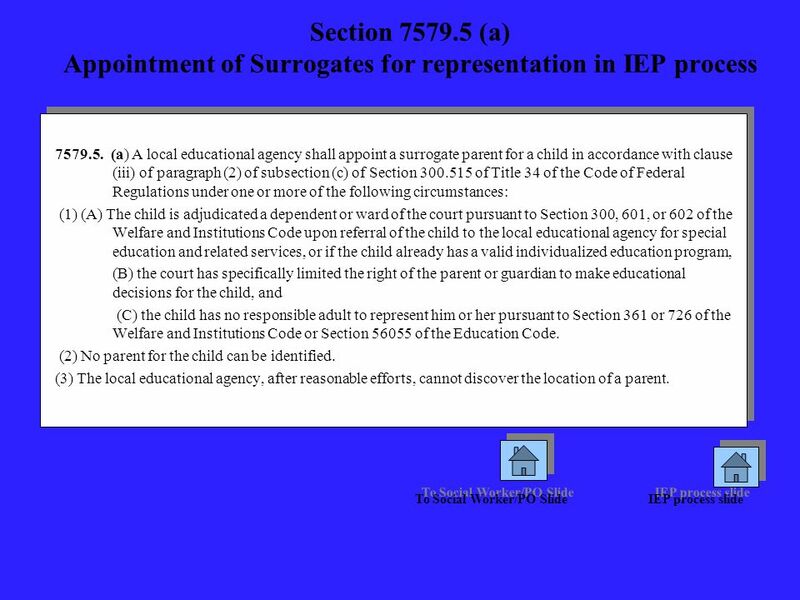 Identify: a) whether the courts have terminated the educational rights of the parents and appointed a surrogate b) The location of the parents if they retain educational rights; c) Whether the location of the parents is unknown. Determine whether relative caregivers may be considered “persons acting in the place of a parent” and no educational rights order or surrogate appointment is required. 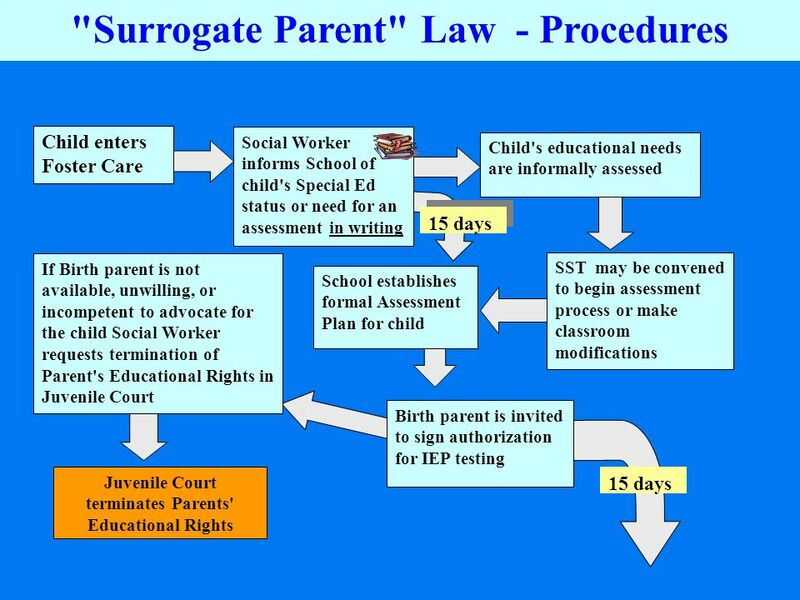 If a different is surrogate preferred, an educational rights order is required before the court or the school district can appoint a surrogate. 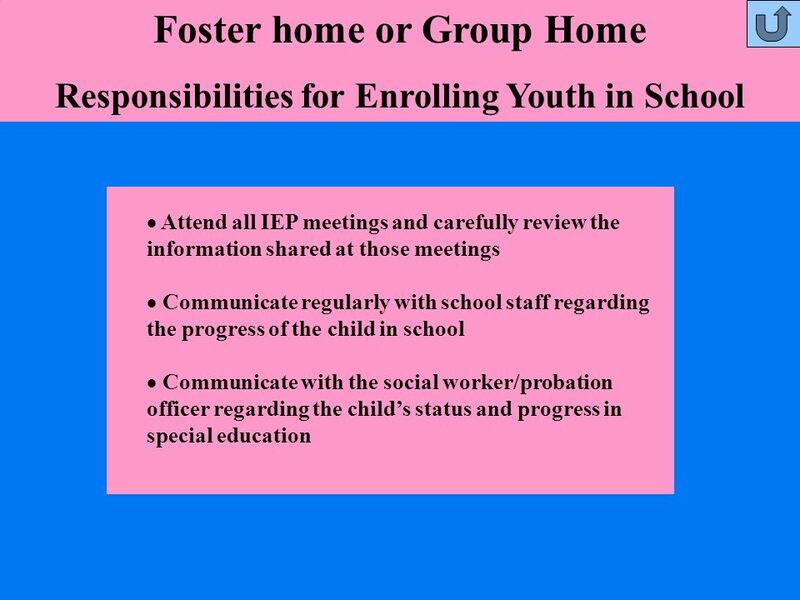 Responsibilities in Placing Foster Youth in School Request records from previous school immediately upon verifying that the child is eligible for enrollment. Inquire about partial credits for work in progress or completed with the previous high school Place the child in the most appropriate classes possible as quickly as possible. Arrange transportation promptly if the child needs to attend school outside of their attendance area. Designation and Duties of LEA Educational Liaison: SEC. 4. 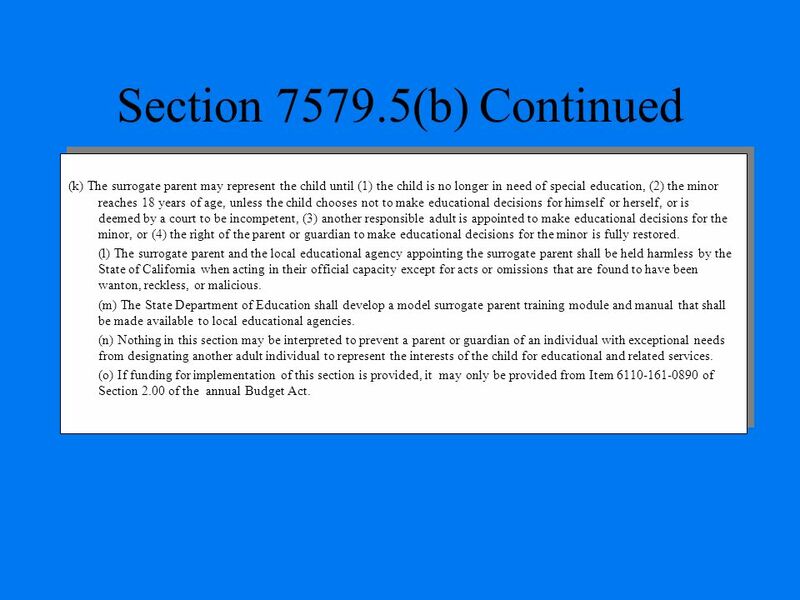 Section is added to the Education Code, to read: (a) This section applies to any foster child who has been removed from his or her home pursuant to Section 309 of the Welfare and Institutions Code, is the subject of a petition filed under Section 300 or 602 of the Welfare and Institutions Code, or has been removed from his or her home and is the subject of a petition filed under Section 300 or 602 of the Welfare and Institutions Code. 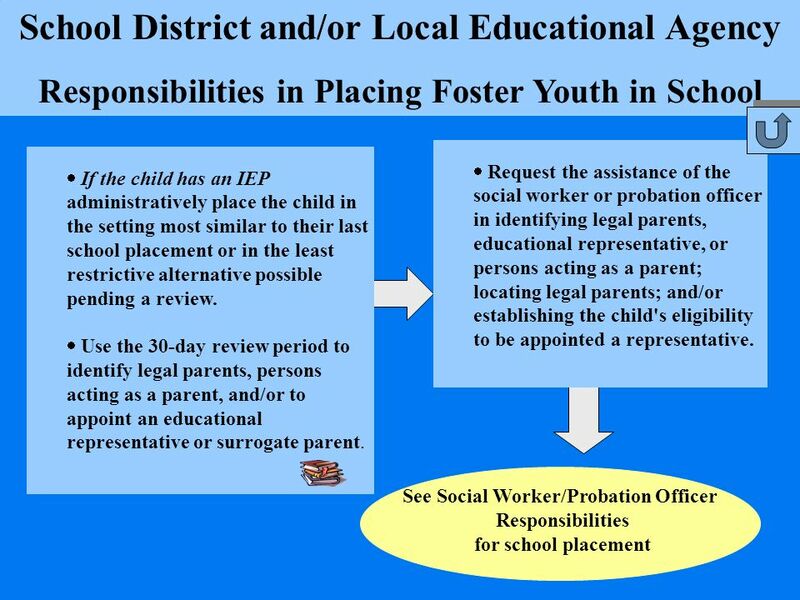 (b) Each local educational agency shall designate a staff person as the educational liaison for foster children. 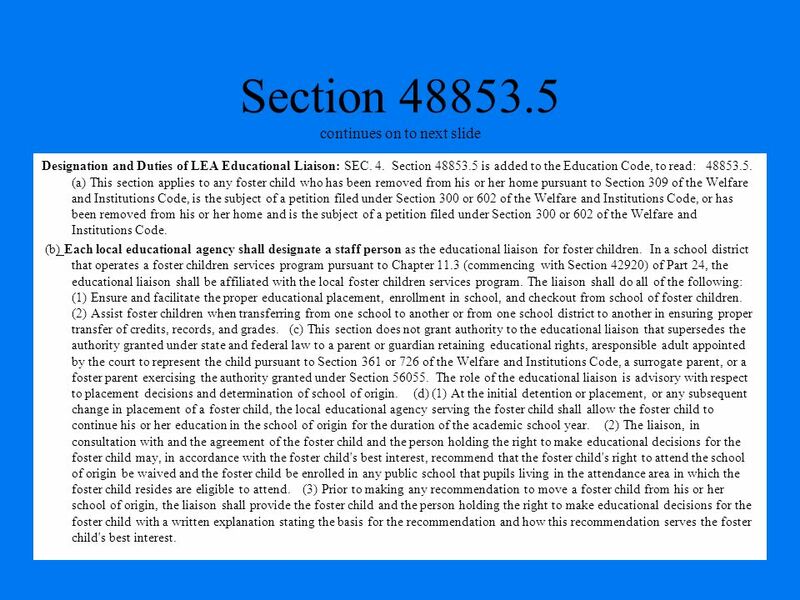 In a school district that operates a foster children services program pursuant to Chapter 11.3 (commencing with Section 42920) of Part 24, the educational liaison shall be affiliated with the local foster children services program. The liaison shall do all of the following: (1) Ensure and facilitate the proper educational placement, enrollment in school, and checkout from school of foster children. 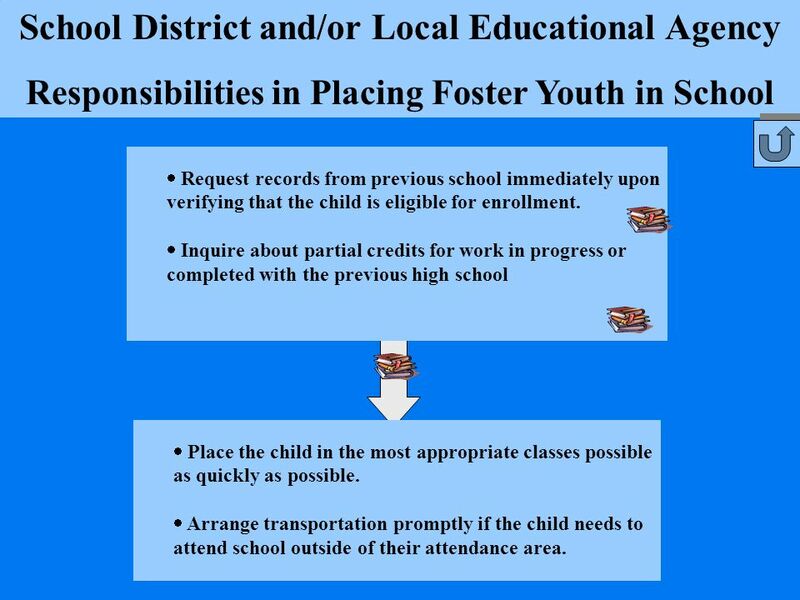 (2) Assist foster children when transferring from one school to another or from one school district to another in ensuring proper transfer of credits, records, and grades. 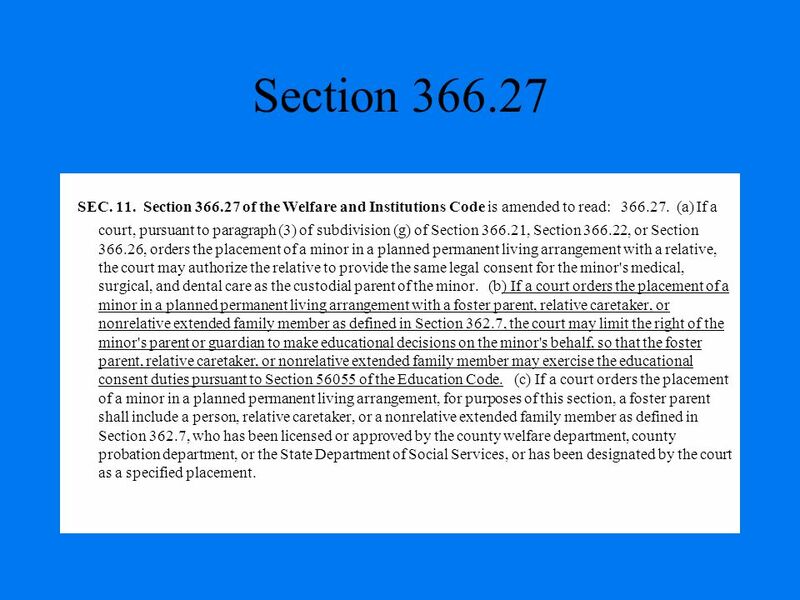 (c) This section does not grant authority to the educational liaison that supersedes the authority granted under state and federal law to a parent or guardian retaining educational rights, aresponsible adult appointed by the court to represent the child pursuant to Section 361 or 726 of the Welfare and Institutions Code, a surrogate parent, or a foster parent exercising the authority granted under Section The role of the educational liaison is advisory with respect to placement decisions and determination of school of origin. 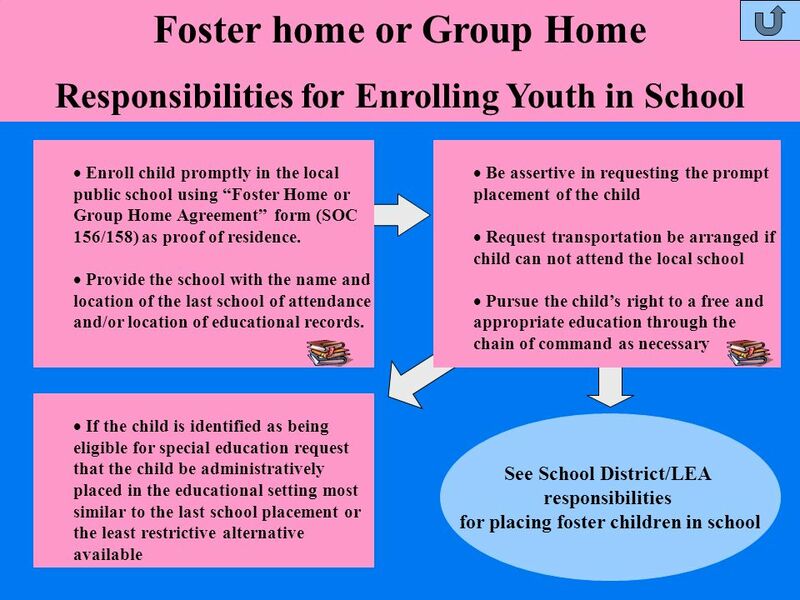 (d) (1) At the initial detention or placement, or any subsequent change in placement of a foster child, the local educational agency serving the foster child shall allow the foster child to continue his or her education in the school of origin for the duration of the academic school year. 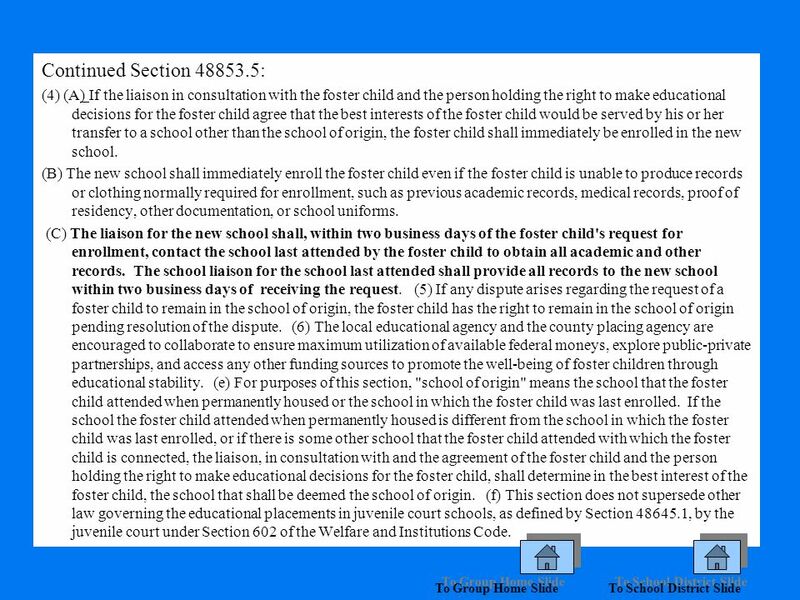 (2) The liaison, in consultation with and the agreement of the foster child and the person holding the right to make educational decisions for the foster child may, in accordance with the foster child's best interest, recommend that the foster child's right to attend the school of origin be waived and the foster child be enrolled in any public school that pupils living in the attendance area in which the foster child resides are eligible to attend. 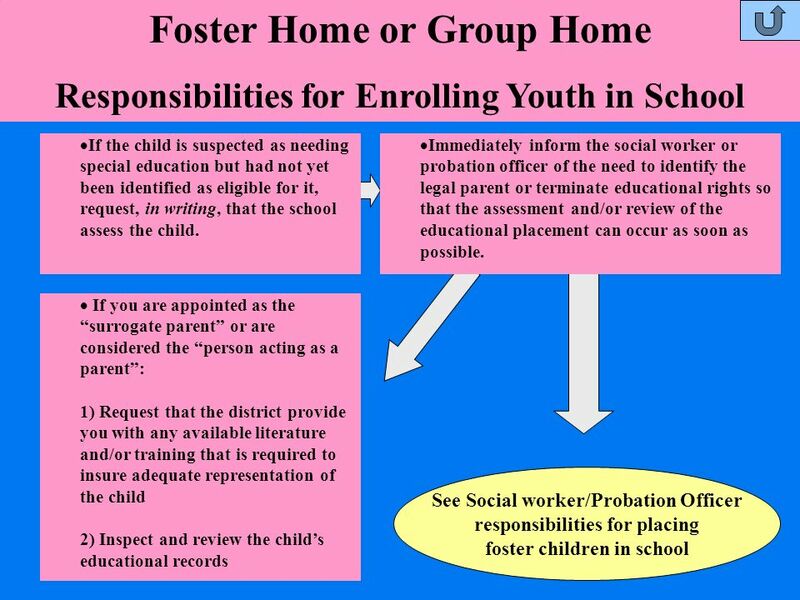 (3) Prior to making any recommendation to move a foster child from his or her school of origin, the liaison shall provide the foster child and the person holding the right to make educational decisions for the foster child with a written explanation stating the basis for the recommendation and how this recommendation serves the foster child's best interest. 21 Section 48853 Section is added to the Education Code, to read: (a) A pupil placed in a licensed children's institution or foster family home shall attend programs operated by the local educational agency, unless one of the following applies: (1) The pupil has an individualized education program requiring placement in a nonpublic, nonsectarian school or agency, or in another local educational agency. 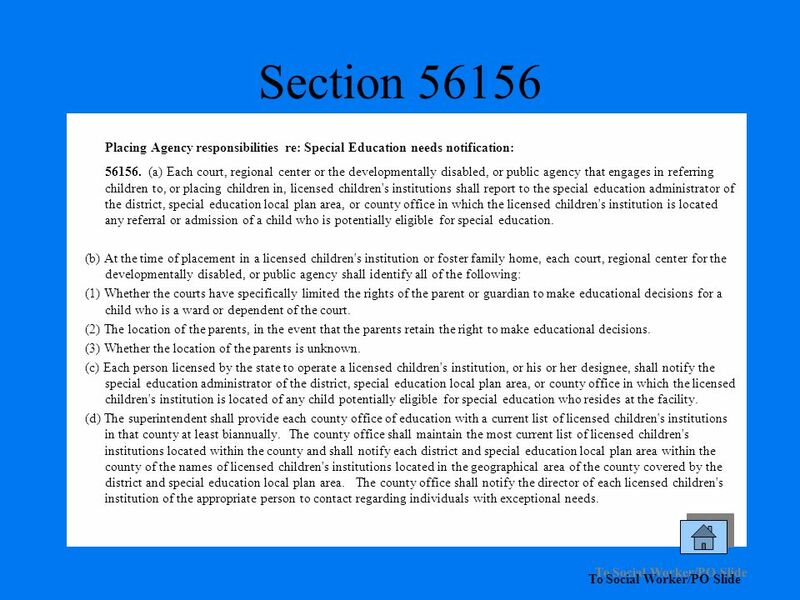 (2) The parent or guardian, or other person holding the right to make educational decisions for the pupil pursuant to Section 361 or 727 of the Welfare and Institutions Code or Section 56055, determines that it is in the best interest of the pupil to be placed in another educational program, or that the pupil continue in his or her school of origin pursuant to paragraph (1) of subdivision (d) of Section (b) Before any decision is made to place a pupil in a juvenile court school as defined by Section , the parent or guardian, or person holding the right to make educational decisions for the pupil pursuant to Section 361 or 726 of the Welfare and Institutions Code or Section 56055, shall first consider placement in the regular public school. (c) If any dispute arises as to the school placement of a pupil subject to this section, the pupil has the right to remain in his or her school of origin, as defined in subdivision (e) of Section , pending resolution of the dispute. (d) This section does not supersede other laws that govern pupil expulsion. 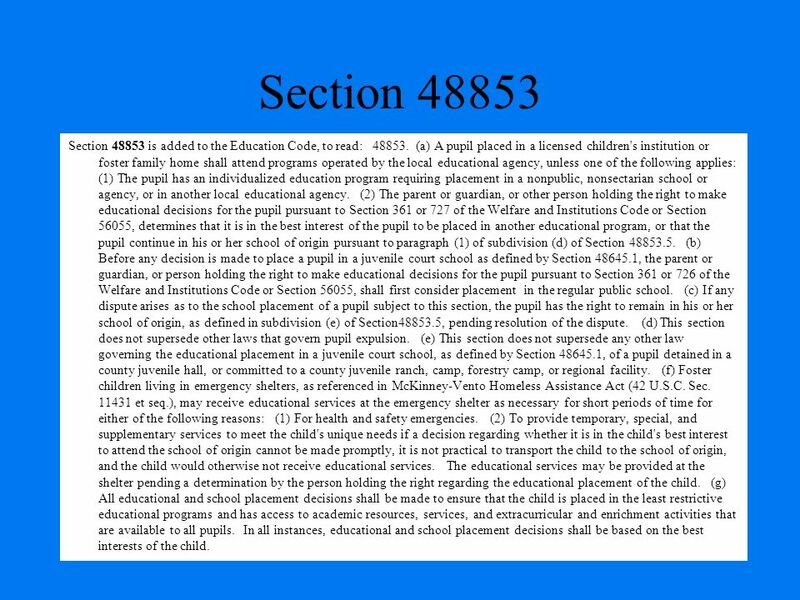 (e) This section does not supersede any other law governing the educational placement in a juvenile court school, as defined by Section , of a pupil detained in a county juvenile hall, or committed to a county juvenile ranch, camp, forestry camp, or regional facility. 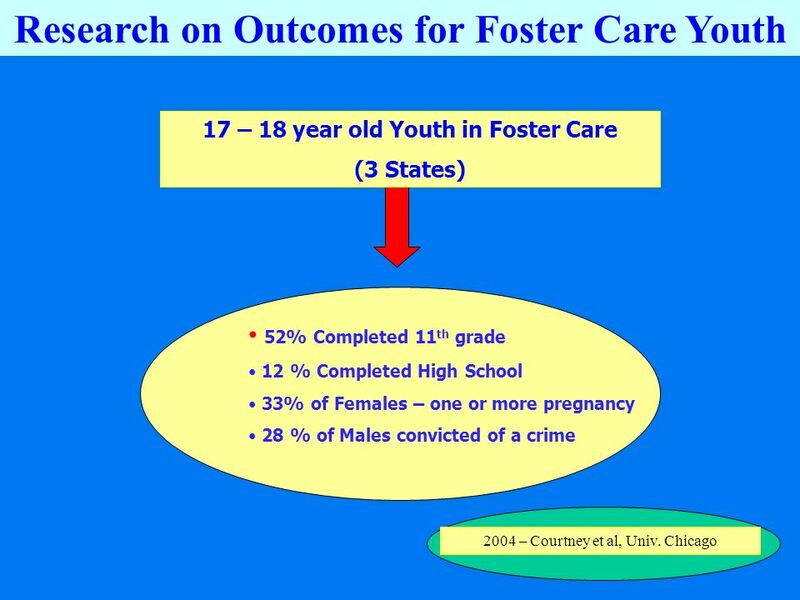 (f) Foster children living in emergency shelters, as referenced in McKinney-Vento Homeless Assistance Act (42 U.S.C. Sec et seq. ), may receive educational services at the emergency shelter as necessary for short periods of time for either of the following reasons: (1) For health and safety emergencies. (2) To provide temporary, special, and supplementary services to meet the child's unique needs if a decision regarding whether it is in the child's best interest to attend the school of origin cannot be made promptly, it is not practical to transport the child to the school of origin, and the child would otherwise not receive educational services. The educational services may be provided at the shelter pending a determination by the person holding the right regarding the educational placement of the child. (g) All educational and school placement decisions shall be made to ensure that the child is placed in the least restrictive educational programs and has access to academic resources, services, and extracurricular and enrichment activities that are available to all pupils. In all instances, educational and school placement decisions shall be based on the best interests of the child. 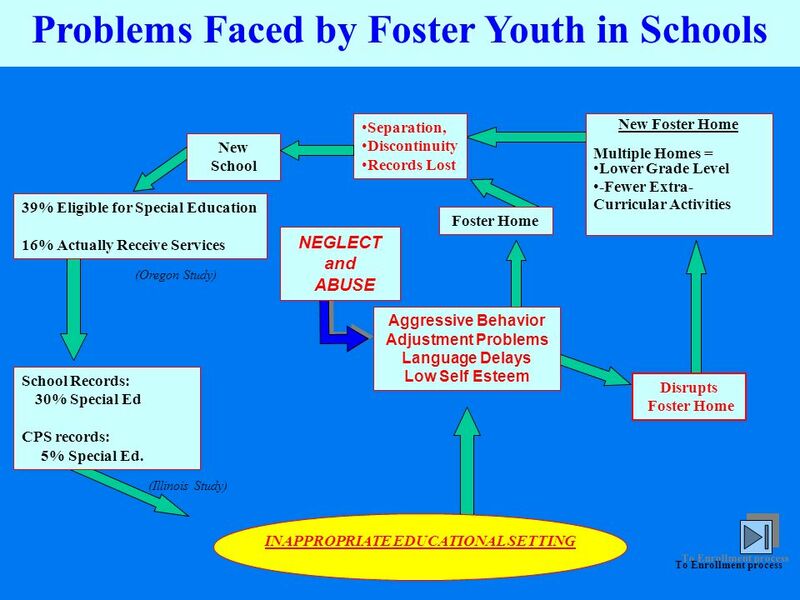 23 Section (a) The Legislature finds and declares that the mobility of pupils in foster care often disrupts their educational experience. The Legislature also finds that efficient transfer procedures and transfer of pupil records is a critical factor in the swift placement of foster children in educational settings. 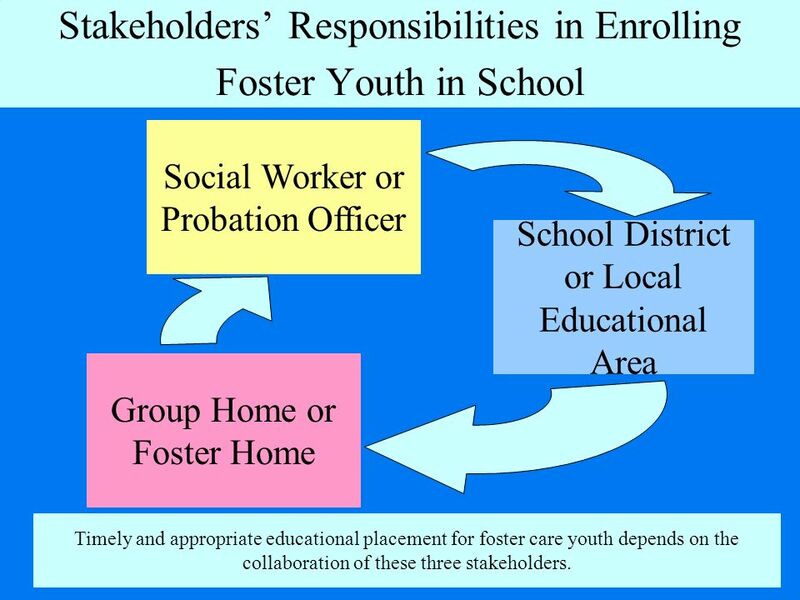 (b) The proper and timely transfer between schools of pupils in foster care is the responsibility of both the local educational agency and the county placing agency. 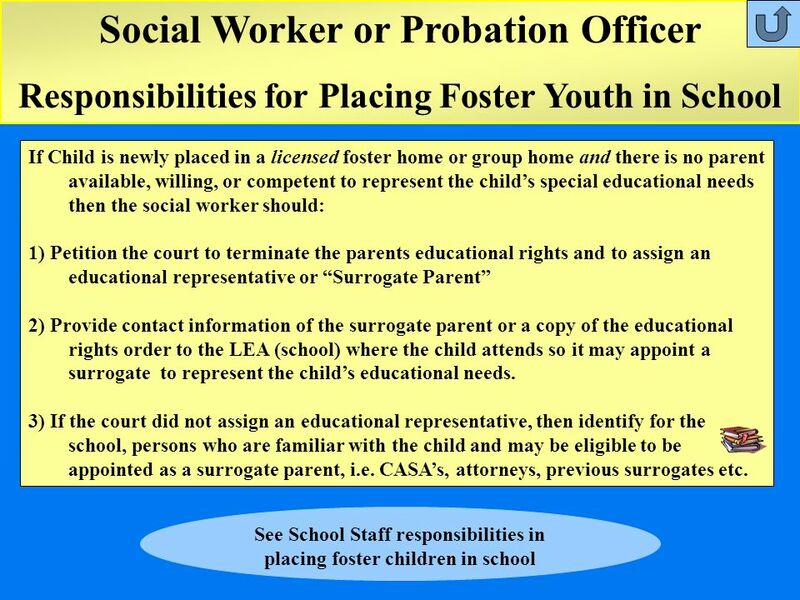 (c) As soon as the county placing agency becomes aware of the need to transfer a pupil in foster care out of his or her current school, the county placing agency shall contact the appropriate person at the local educational agency of the pupil. The county placing agencyshall notify the local educational agency of the date that the pupil will be leaving the school and request that the pupil be transferred out. 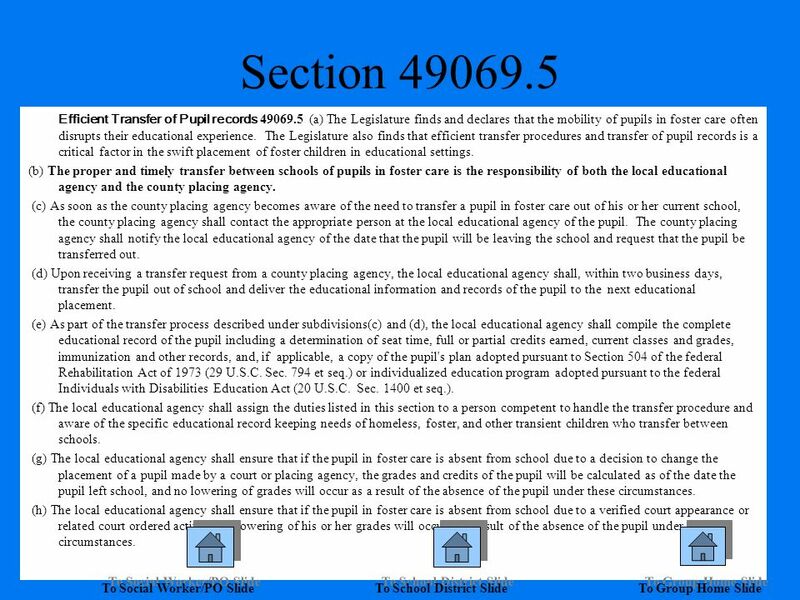 (d) Upon receiving a transfer request from a county placing agency, the local educational agency shall, within two business days, transfer the pupil out of school and deliver the educational information and records of the pupil to the next educational placement. 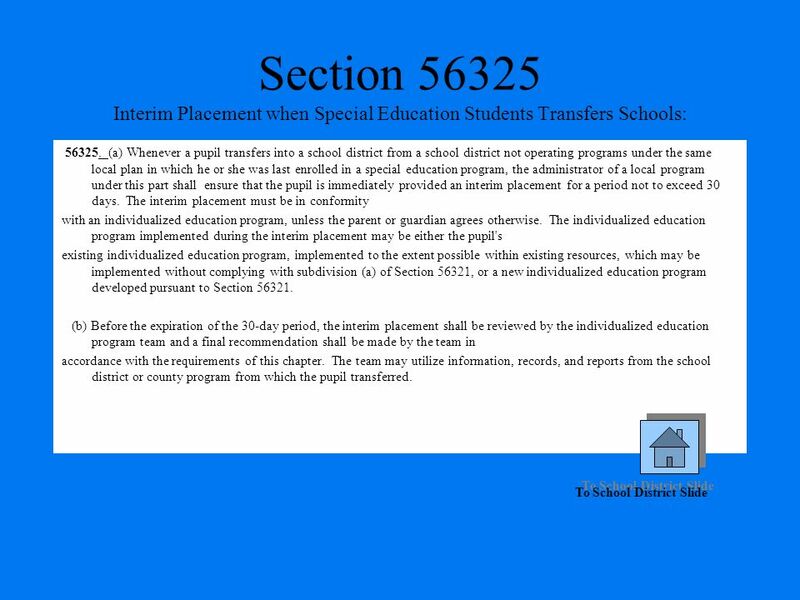 (e) As part of the transfer process described under subdivisions(c) and (d), the local educational agency shall compile the complete educational record of the pupil including a determination of seat time, full or partial credits earned, current classes and grades, immunization and other records, and, if applicable, a copy of the pupil's plan adopted pursuant to Section 504 of the federal Rehabilitation Act of 1973 (29 U.S.C. Sec. 794 et seq.) orindividualized education program adopted pursuant to the federal Individuals with Disabilities Education Act (20 U.S.C. Sec et seq.). (f) The local educational agency shall assign the duties listed in this section to a person competent to handle the transfer procedure and aware of the specific educational record keeping needs of homeless, foster, and other transient children who transfer between schools. (g) The local educational agency shall ensure that if the pupil in foster care is absent from school due to a decision to change the placement of a pupil made by a court or placing agency, the grades and credits of the pupil will be calculated as of the date the pupil left school, and no lowering of grades will occur as a result of the absence of the pupil under these circumstances. (h) The local educational agency shall ensure that if the pupil in foster care is absent from school due to a verified court appearance or related court ordered activity, no lowering of his or her grades will occur as a result of the absence of the pupil under these circumstances. 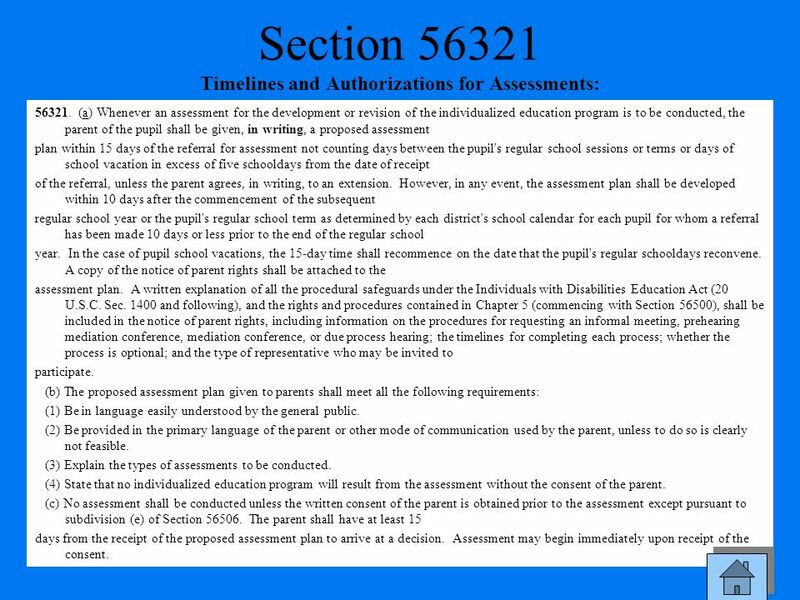 (a) Whenever an assessment for the development or revision of the individualized education program is to be conducted, the parent of the pupil shall be given, in writing, a proposed assessment plan within 15 days of the referral for assessment not counting days between the pupil's regular school sessions or terms or days of school vacation in excess of five schooldays from the date of receipt of the referral, unless the parent agrees, in writing, to an extension. However, in any event, the assessment plan shall be developed within 10 days after the commencement of the subsequent regular school year or the pupil's regular school term as determined by each district's school calendar for each pupil for whom a referral has been made 10 days or less prior to the end of the regular school year. In the case of pupil school vacations, the 15-day time shall recommence on the date that the pupil's regular schooldays reconvene. A copy of the notice of parent rights shall be attached to the assessment plan. 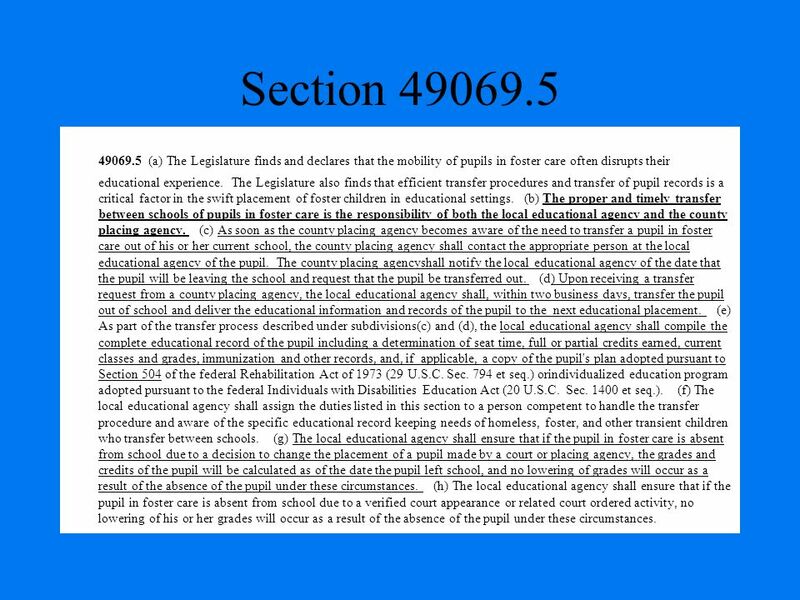 A written explanation of all the procedural safeguards under the Individuals with Disabilities Education Act (20 U.S.C. Sec and following), and the rights and procedures contained in Chapter 5 (commencing with Section 56500), shall be included in the notice of parent rights, including information on the procedures for requesting an informal meeting, prehearing mediation conference, mediation conference, or due process hearing; the timelines for completing each process; whether the process is optional; and the type of representative who may be invited to participate. (b) The proposed assessment plan given to parents shall meet all the following requirements: (1) Be in language easily understood by the general public. (2) Be provided in the primary language of the parent or other mode of communication used by the parent, unless to do so is clearly not feasible. (3) Explain the types of assessments to be conducted. (4) State that no individualized education program will result from the assessment without the consent of the parent. (c) No assessment shall be conducted unless the written consent of the parent is obtained prior to the assessment except pursuant to subdivision (e) of Section The parent shall have at least 15 days from the receipt of the proposed assessment plan to arrive at a decision. Assessment may begin immediately upon receipt of the consent. 29 Section (b) Continued (f) The surrogate parent shall comply with federal and state law pertaining to the confidentiality of student records and information and shall use discretion in the necessary sharing of the information with appropriate persons for the purpose of furthering the interests of the child. (g) The surrogate parent may resign from his or her appointment only after he or she gives notice to the local educational agency. 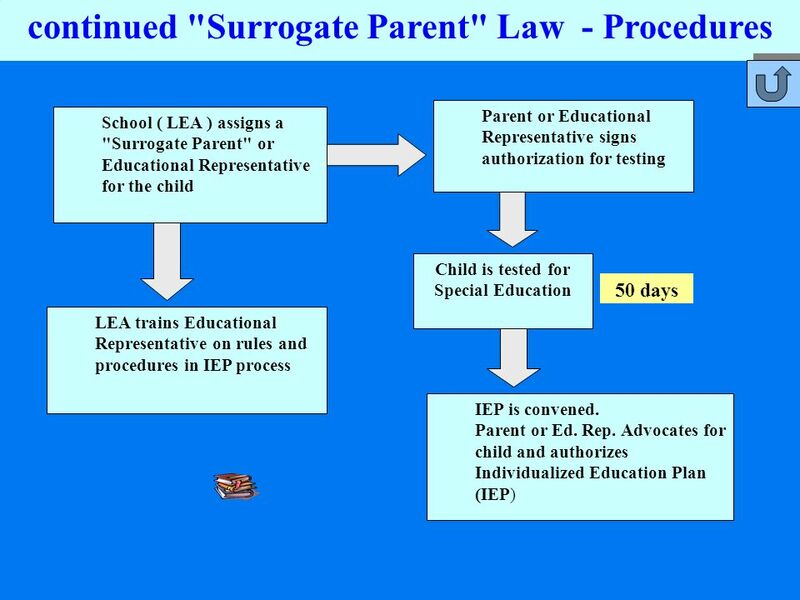 (h) The local educational agency shall terminate the appointment of a surrogate parent if (1) the person is not properly performing the duties of a surrogate parent or (2) the person has an interest that conflicts with interests of the child entrusted to his or her care. (i) Individuals who would have a conflict of interest in representing the child, as specified under federal regulations, may not be appointed as a surrogate parent. 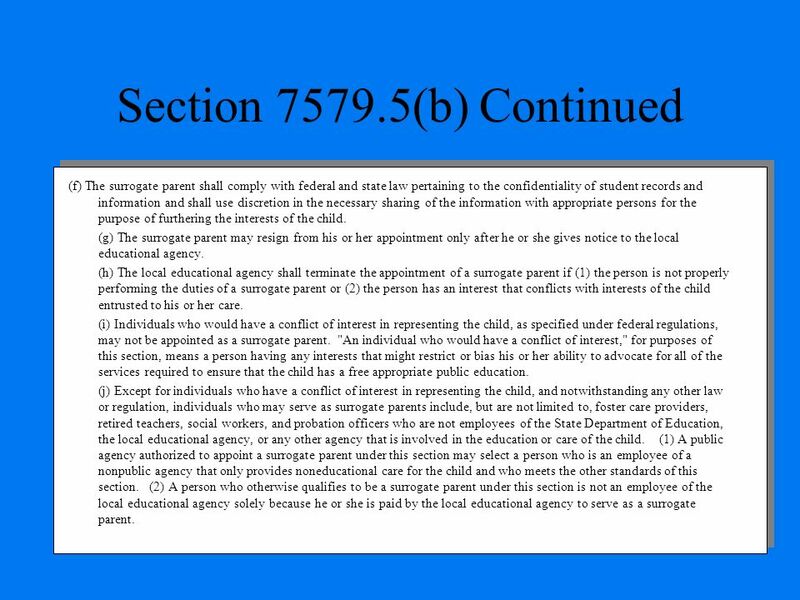 "An individual who would have a conflict of interest," for purposes of this section, means a person having any interests that might restrict or bias his or her ability to advocate for all of the services required to ensure that the child has a free appropriate public education. (j) Except for individuals who have a conflict of interest in representing the child, and notwithstanding any other law or regulation, individuals who may serve as surrogate parents include, but are not limited to, foster care providers, retired teachers, social workers, and probation officers who are not employees of the State Department of Education, the local educational agency, or any other agency that is involved in the education or care of the child. (1) A public agency authorized to appoint a surrogate parent under this section may select a person who is an employee of a nonpublic agency that only provides noneducational care for the child and who meets the other standards of this section. (2) A person who otherwise qualifies to be a surrogate parent under this section is not an employee of the local educational agency solely because he or she is paid by the local educational agency to serve as a surrogate parent. 30 Section (b) Continued (k) The surrogate parent may represent the child until (1) the child is no longer in need of special education, (2) the minor reaches 18 years of age, unless the child chooses not to make educational decisions for himself or herself, or is deemed by a court to be incompetent, (3) another responsible adult is appointed to make educational decisions for the minor, or (4) the right of the parent or guardian to make educational decisions for the minor is fully restored. 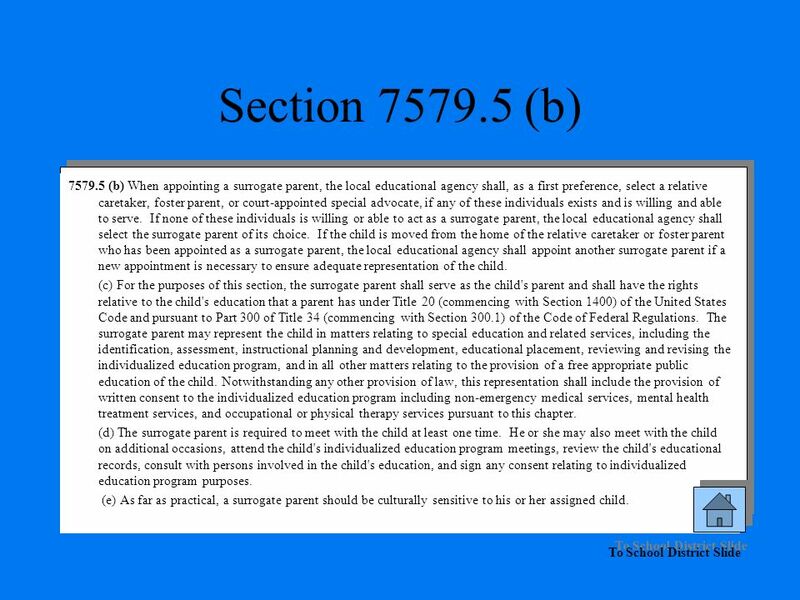 (l) The surrogate parent and the local educational agency appointing the surrogate parent shall be held harmless by the State of California when acting in their official capacity except for acts or omissions that are found to have been wanton, reckless, or malicious. (m) The State Department of Education shall develop a model surrogate parent training module and manual that shall be made available to local educational agencies. (n) Nothing in this section may be interpreted to prevent a parent or guardian of an individual with exceptional needs from designating another adult individual to represent the interests of the child for educational and related services. (o) If funding for implementation of this section is provided, it may only be provided from Item of Section 2.00 of the annual Budget Act. 31 Section SEC Section of the Welfare and Institutions Code is amended to read: (a) If a court, pursuant to paragraph (3) of subdivision (g) of Section , Section , or Section , orders the placement of a minor in a planned permanent living arrangement with a relative, the court may authorize the relative to provide the same legal consent for the minor's medical, surgical, and dental care as the custodial parent of the minor. (b) If a court orders the placement of a minor in a planned permanent living arrangement with a foster parent, relative caretaker, or nonrelative extended family member as defined in Section 362.7, the court may limit the right of the minor's parent or guardian to make educational decisions on the minor's behalf, so that the foster parent, relative caretaker, or nonrelative extended family member may exercise the educational consent duties pursuant to Section of the Education Code. 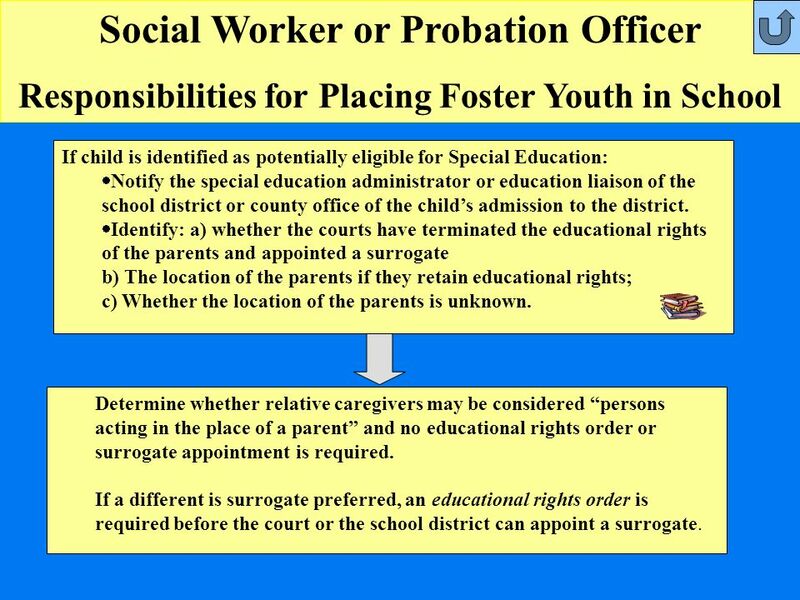 (c) If a court orders the placement of a minor in a planned permanent living arrangement, for purposes of this section, a foster parent shall include a person, relative caretaker, or a nonrelative extended family member as defined in Section 362.7, who has been licensed or approved by the county welfare department, county probation department, or the State Department of Social Services, or has been designated by the court as a specified placement. 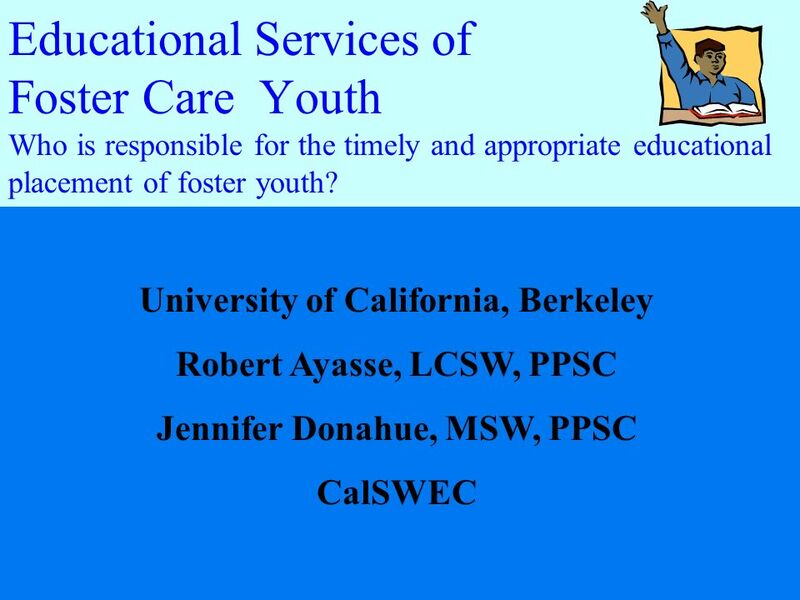 Download ppt "Educational Services of Foster Care Youth Who is responsible for the timely and appropriate educational placement of foster youth? University of California,"
School & Community Collaboration Through McKinney-Vento. Educational Stability for Children Placed in Resource Homes. 10 Things to Expect Regarding Your Child’s Individualized Education Program (IEP) Meeting. 1 EDUCATION PARENTS / LEGAL GUARDIAN: Legal Rights and Responsibilities to Address Your Child’s Education. Santa Barbara County SELPA Parentally Placed Students in Private School Training & Meaningful Consultation for Private School Representatives and Parent. 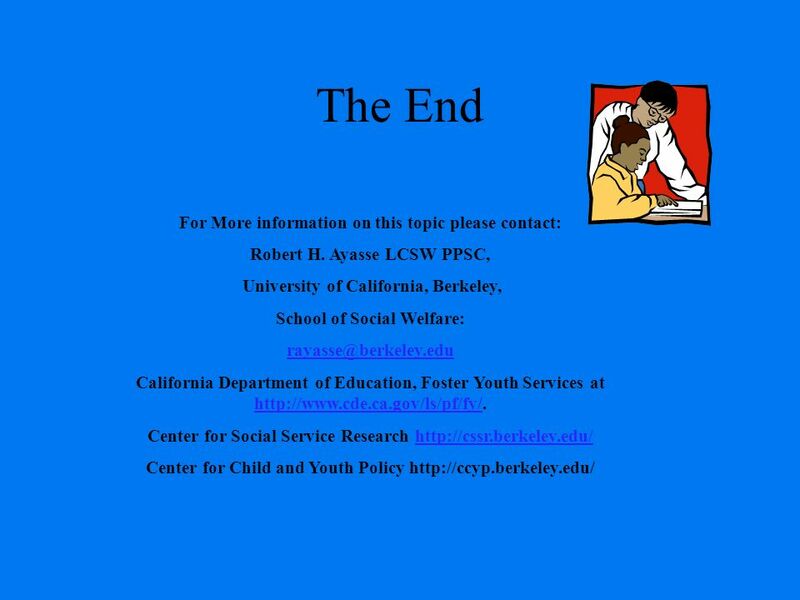 4/18/2015AB 490 Implementation An overview of AB 490’s changes to the law and creation of enhanced education rights for foster children Closing the Education. Which of the following is not a duty of the local liaison? a)Identifying homeless children and youth b)Coordinating with community agencies c)Assisting. Region 3 Monitors April What is a REED? It is a “process” whereby the IEP team reviews existing evaluation data to make evaluation decisions about. Defensible IEPs Douglas County School District 1 Module V: Documentation and Timelines. 1 The Individuals with Disabilities Education Improvement Act (IDEA 2004) Implementation Training Spring/Summer 2005. 9/2/20151 Ohio Family and Children First An overview of OFCF structure, membership, and responsibilities.